DELIGHTFUL !! and affordable three bedrooms apartment exceptionaly well located , in Patio Bullrich area , on the corner of Libertad St. and Libertador Av., surrounded by many five star hotels . 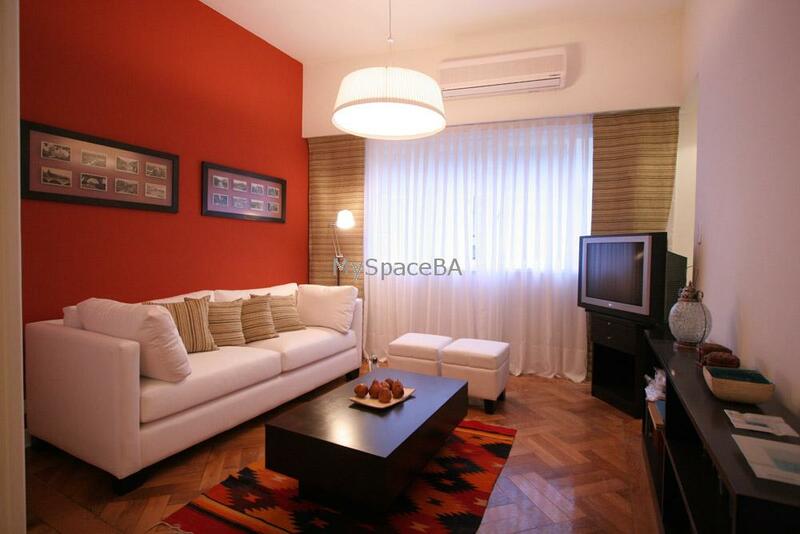 The apartment is very bright and it offers a beautiful living room with comfortable sofa , cable TV, TV , Home theather . It has a homely dinning area with table and seats for eight. The master bedroom has a queen size bed and walk in wardrobe , aircon , safe box and TV . The second bedroom has a Queen size bed which can be separated in two single beds. Aircon and TV . There is a complete bathroom with jacuzzi tub and shower. The third bedroom has a single bed and en suite bathroom with shower . The kitchen is fully equipped, it offers a table and seats. Very good option to make you stay really pleasant. Three aircon hot / cold . Internet Fast Connection . Wi Fi . Home Theather . TV in bedrooms . Music System . Landline telephone for local calls . Safe box . Two bathroom . Kitchen equipped with refrigerator , freezer , washing / dryer machine . Dishwasher . Coffe-maker . Toaster . Blender . Microwave . Dishes . Kitchen utensils . Towels and bed linen . Cleaning service . Vintage elegant residential building , eight stories , built in the 1930's , in very good condition, with genuine Old World charm . Two elevators, broad staircases and ample lobbies. City centre , Patio Bullrich Shopping Center , museums , cinemas , restaurants , art gallery , banks , residential area , commertial area . Parks, plaza.